Earlier one of the problems of children's roller skates was the inability to move them apart, to match the size of the growing child's foot. But in recent decades, the market appeared many sliding models and increase the size of the skate was a matter of five minutes. Usually roller skates are moved apart on 4-5 cm, and the young athletes enough for 2-3 seasons. Then increasing not only the length of the foot of the child, but also its completeness, so simple elongation of the rollers, the problem will not solve it. There are models in which elongates the front of the roller, there are models with an increase in the back or with an increase in both directions. The advantage over the first: when shifting the heel part of the weight distribution and changing the rollers become difficult to manage. Expensive models the rollers can have a system that modifies the fullness of the Shoe. But they are not yet sufficiently popular as some of them are moving apart forming the bumps inside the Shoe that cause discomfort when riding. There are several mechanisms for changing the size of roller skates. The most advanced – button, it changes size by pressing the corresponding button. More common mechanism with screw or eccentric mounted on the platform. The size is not changing smoothly, and speed, since the Cam is fixed only in certain positions. To resize, simply remove the screw or plastic plug, push the frame to the right size, and again tighten. The third popular option, the size is fixed with a special rod. Unscrew the nut holding it, install the correct size and tighten the nut. Details of adjustment of a roller described in the instructions. But it is best when buying to ask the seller to demonstrate the system size change and remember the order of operations. 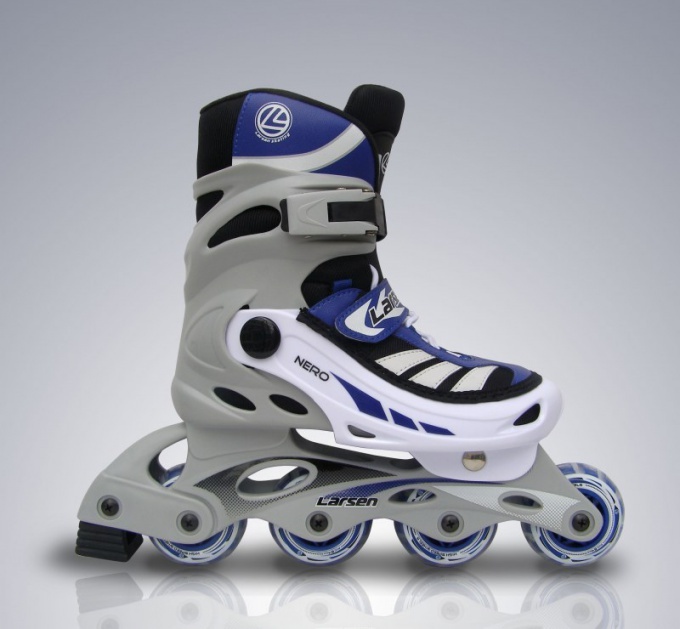 If the skates do not have an adjusting system, you can try to post. To do this, when the heel strap tighten as tight as you can to when you roll the heel is not moving forward. Usually after 2-3 skate shoes pair on offers half the size or even the size. You can try to increase the size by using thermoforming. But you should first read the instructions and make sure that the thermoforming is suitable for this model. You will also find details of the procedure. Typically, this heat boot for 10-15 minutes (exact temperature and time indicated in the instructions), then put on your feet and ride. It helps to add" boot 1-2 sizes. In Soviet times, the Shoe size has increased through the freezer to the refrigerator. Fit this way, and for skates. Take a double plastic bag and place it inside the Shoe, fill with water and put in the freezer. The freezing of 10 volumes of water are transformed into 11 volumes of ice. When pull the horse out of the freezer and thawed, its volume will increase by 10%. So your skates will last you a long time, not just one season, for them to properly care for. Regular care and cleaning the rollers will help increase their lifespan. But not everyone knows how to properly clean the rollers, and therefore, many make mistakes that result in roller skates deteriorating rapidly. Roller skating wipe with a cloth every time after you've finished the ride. Bearings – the most capricious and require special care detail of the rollers. Do not allow them gets wet. Wipe the bearings with a dry cloth or tissue. To remove dust and sand from hard-to-reach places, slightly loosen wheel rollers or clean them with a vacuum cleaner. If water gets into the bearings, inject in them a special vaudevillian. This solution can be purchased at many stores. If the bearings are clogged with dirt, carefully clean them with gasoline. To do this, remove from the wheels of roller skates bearings, remove the old grease and disassemble the bearings. If they are not collapsible, remove the boot and grease. Rinse the bearings - it will put them into a jar of gasoline and mess with a wooden stick on the bottom, about five minutes. The wand must be made of wood. Note: wash one bearing and not all at once. After each bearing is thoroughly cleaned and dried, brush again with new grease and insert inside the wheel. Be careful: the bearing must be inserted inside the open side. Do not forget to regularly lubricate the bearings with special grease or regular engine oil. To make them easier to grease, inject grease into the bearing using a syringe. Frequency of lubrication depends on the quality of lubricants and, of course, how often you ride. After each ride clean the boots of the roller skates. To do this, use a regular Shoe brush or a cloth. But in any case do not apply to them Shoe cream. 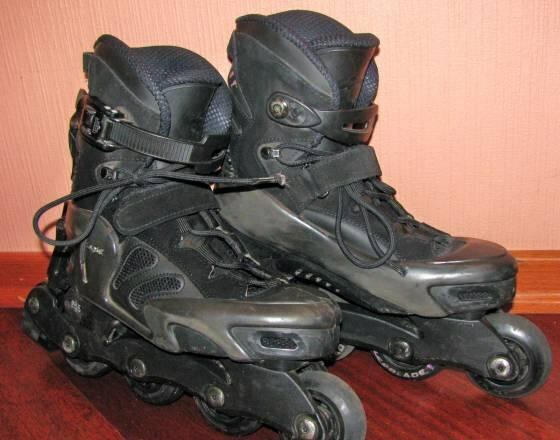 To get your roller skates will serve you for as long as possible, check the condition of the wheels. As soon as you see that they are starting to wear off, swap them. The skating should be fun, not blisters on my feet, so it is very important to choose the videos to the exact size of the feet. But when fitting many faced with the fact that I can't properly fit the skates. Try on roller skates in those socks in which you intend to ride. To do this you suitable "roller" socks, and cotton. It is not recommended to wear under skates wool or synthetic socks. Choose rollers to the exact size. A fitting start with a larger size and gradually reduce it until until you feel that the heel rests on the heel. Please note that shoes roller skates of the break, and if you buy rollers at least one size larger, then after a while it will just dangle you feet. To make it easier to choose the right shoes, you can use the table legs. You must correctly fasten the skates. The fasteners of the Shoe is usually composed of three elements: clips, heel strap and laces. First of all boot fully extend the tongue. Now you can start tightening the laces. Try as you can to evenly distribute the pressure of the laces along the entire length of the upper part of the foot. When tightening do not need to squeeze the leg. Now attach the heel. Don't pinch, but try to make it so that when the process exits, the heel did not move neither sideways nor up. If you try to stand you feel the shift, then try tighten the laces and heel strap. If that does not work, you should move on to trying on another pair of skates. The last stage is fixing clips. Open the clip, thread the strap to the clamp. Next, you need to snap the clip, while the cuff of the boot should fit to clasp your foot. Here also leg in any case should not hang out in the cuff. Now you can wear the second roller and carefully to his feet. Like, if possible, at least 10-15 minutes. During this time, you can understand, comfortable for you or not. If you are uncomfortable, you feel some discomfort, immediately pull the fitting out of options. Only when you are completely confident about your choice, feel free to pay a long-awaited purchase.